Thunder cloud plum trees are a fast-growing ornamental tree hardy between USDA plant hardiness zones 5 and 7. The tree produces reddish-purple leaves, with pink and white blossoms in the spring and small, edible fruits in the fall. It has a dense, upright form and grows 15 to 25 feet high. 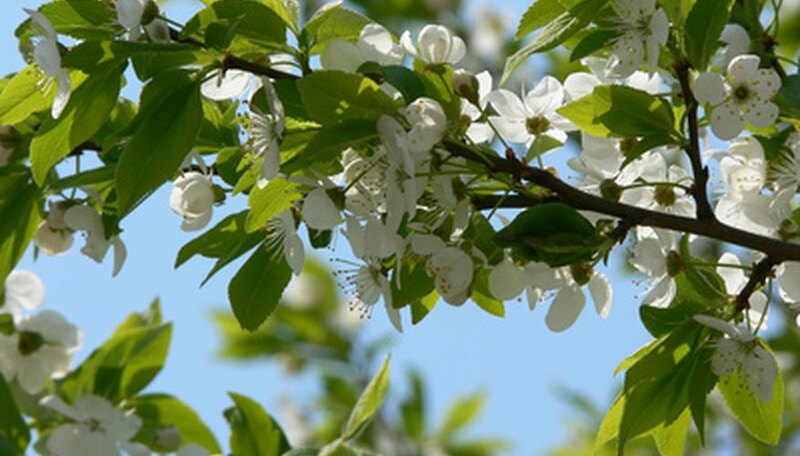 Pruning Thundercloud Plum trees in mid-spring after leaves have matured causes the least amount of sap bleeding, according to Mr. Jacks Farm. While the bleeding sap doesn't cause harm to the tree, it is messy. Trees can also be pruned in late winter or early spring. Pruning trees in late summer or early fall causes trees to produce new growth, which is easily damaged by winter weather. Pruning at this time is not advisable. Homeowners should prune trees to remove dead, diseased limbs or to open up the canopy. More trees are damaged by over pruning than by being left alone. The canopy of a plum tree is upright and very dense. Removing vertical limbs, growing less than 12 inches from other branches, increases light to the canopy and improves the tree's health. Branches growing too closely together can create narrow crotches which may eventually crack and damage the tree. Make cut 1/4 inch above a bud or lateral branch instead of in the middle of a branch. These cuts heal more quickly and leave a smaller wound, advises Mr. Jacks Farm. Pruning shears are used for narrow branches, less than 1/2 inch in diameter, while pruning loppers are used for branches 1 1/2 inches and smaller. A pruning saw has smaller teeth than a carpenter's saw and can reach tight spots, making it an ideal choice for branches larger than 1 1/2 inches. A pruning paint is not necessary after pruning thunder cloud plum trees, according to Texas A&M University and may actually promote disease. Plum trees are best left alone. Early spring is the ideal time for major pruning tasks, although homeowners may prune at other times of the year to remove diseased limbs or suckers. If a tree receives damage due to high winds or a storm, remove limbs immediately, regardless of the time of year.